Don’t Miss the Developmentally-Appropriate Responsibility Chart! And then, it happens. She leans back in her chair – as she often does while eating meals – and her snack dribbles down onto the floor. Dad, witnessing this, says in a frustrated tone “Lean! You’ve got to lean!” which is a refrain he utters frequently at dinnertime as the dining room carpet becomes dotted with food crumbs. Mom and Dad watch Molly’s face as the red hue seems to advance from her chin to forehead. And that’s it – conversation over. She springs out of her chair and off – up to her room. Perhaps this is a familiar scene to you. Though Mom and Dad attempt to communicate as a team, your child may feel outnumbered. Though you may approach the conversation with the best, most constructive intentions, defensiveness may creep up and when it does, your chances of influencing your child’s behaviors are slim to none. It may end in a power struggle. It may end with scolding or yelling, crying or silence, and certainly with frustrations on all sides. Yet the importance of these discussions throughout your child’s development remains. Yes, they’ll grow more and more capable of taking on responsibilities that they could not attempt in previous years. And not only do you want to make sure that the tasks get accomplished (and you don’t turn into the family nag) but also, you want your child to internalize the desire and skills associated with taking responsibility. So the question becomes, how do you help a child learn to take increasing responsibility for contributing to your household? There are numerous ways. And I’ll share those tips and helpful tools too. But first, I’ll share the second, far more successful attempt this family took with the responsibility conversation later that day. After Molly stormed to her room, Mom and Dad refilled their coffee (yes, this was a necessary next step!) and sat down to talk with one another about what worked, what didn’t and formulate a game plan. They framed some aspects of the conversation really well. The snack and sitting together was nice. The clipboard ready for their plan was helpful. Recognizing the ways in which Molly already contributed was key. And Molly seemed pleased and responsive to that recognition. They weren’t scolding nor were they acting like they were starting from scratch. She had a history of positively contributing and her parents were noticing those contributions. But the minute Dad shifted to scolding, the power dynamic changed. Before the comment on leaning, there was shared power. But after, there were sides – the parents versus the child. So the team approach they were trying for failed. As Mom and Dad reflected on this, they talked about how to sustain shared power throughout the conversation. How can we approach Molly so that we invite her feedback and ensure that she’s heard, understood and given a voice and a choice to take ownership of her contributions? Molly was eager to find a way not to be nagged so she helped with creating a list of ways she could take more responsibility. They went through each idea and discussed how she would remember in the moment. The ideas all came from Molly. For leaning over her food at the table during meals, Molly wanted to make a little reminder sign that read, “Please lean” with a smiley face. (Clearly, she wanted a friendly reminder!) And she put a pillow behind her to push her forward in her chair. For screen time limits, she was going to set a timer and shut down the iPad when the timer buzzed. For each responsibility, Molly figured out a way that she could remember either with a sign or an alarm. Mom, Dad, and Molly ended their family conversation with the agreement to work together to make signs and set alarms to get her prepared to be successful. And so far, Mom and Dad report it has been highly successful (true story!). Molly is keeping up with her chores. And Mom and Dad are making sure to notice and share their appreciation for her actions when they see those helpful behaviors. Children and adults alike are intrinsically motivated by feeling a sense of autonomy, belonging and competence. Contributing to the care of your family’s home can meet all three of those needs. As you formulate ways to discuss, consider engaging these forms of motivation to help internalize a sense of responsibility. Collaborate as a family team. Do you notice you gain energy for the work ahead when others are digging in alongside of you? It’s true for kids too. Don’t assign and then, kick back and watch. 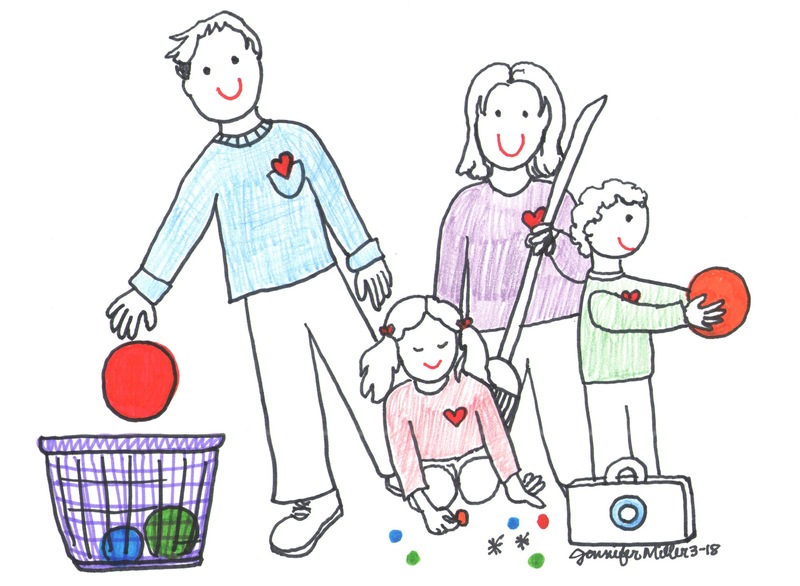 When it’s time to clean up, when it’s time to do laundry, or whatever the chore, family members who work together will get chores accomplished together. Children will feel a greater sense of motivation to contribute if you are working right alongside them. Be sure you allow your child to take responsibility for a task and complete it themselves. Don’t go behind and fix it if you feel it’s not up to your standards. This does not offer a child the sense of satisfaction of completing a task. And if there are a number of tasks, make a checklist so that your child can check off each when completed. Be sure your child is adequately prepared to load the dishwasher or set the table. When introducing a new responsibility, try interactive modeling as a way to teach your child how to contribute. We, as parents, often forget that children are still learning many ways of doing things that we take for granted. Interactive modeling can be a way to ensure you are doing what you can to help your child learn the actions necessary to meet your expectations. 1. Say what you will model and why. 3. Ask your child what he noticed. 4. Invite your child to model. 5. Ask what he noticed with his own modeling. The following is an example of how this might look between a parent and child. Be certain and pick a time to do this when you do not have time pressures. 1. You might say, “Watch how I play waiter. You can try it after me!” You could wear an apron like a waiter might or put on a name tag. 4. You might say, “Okay, your turn to pretend to be the waiter.” Dress him up in the apron and name tag to maintain the fun. 6. Now practice it together. Don’t skip this! It’s important that your child gets the chance to work alongside you while cooperatively going through the process. 7. In providing feedback, be specific and start with strengths. “I noticed you handled the silverware carefully. Terrific! When you put the napkins down, be sure to count so that each person gets one.” If you share too many issues, your child might tune out so pick your top few areas for improvement only. If you find yourself in a position similar to Molly’s parents where they were hearing themselves regularly nagging to get tasks accomplished, then go back to the drawing board. Brainstorm solutions to specific challenges to eliminate nagging. For more on brainstorming solutions with your child, check out this article. Recognize and celebrate but don’t bait. It’s critical to notice and point out when your children are contributing. This may seem insignificant but your words can have a reinforcing effect so that they are much more apt to continue the positive behavior. “I notice you put away your dishes without my asking!” is all you need say. If your family team accomplishes a larger project, going out for ice cream, watching an enjoyable movie, and simply doing a family team cheer can further celebrate your hard work. Many parents and teachers use reward stickers or charts to guide home contributions trying to incentivize work. Others pay for chores through an allowance or a pay-per-task. Though it may seem an easy solution, it does not help children internalize their role as a caring family member and contributor. It does not send the message, “we contribute to the care of our home because we are part of this family.” Instead, it serves as bait and sometimes may not be enticing enough to keep the motivation high. I tested this with my own son on three different occasions. We brainstormed a list of regular responsibilities and additional ones that could be done for payment. Consistently the ones that were on his regular responsibilities’ list were accomplished and he didn’t touch the other ones. Why? Play was far more important on his agenda. “At any age, rewards are less effective than intrinsic motivation for promoting effective learning” states Alfie Kohn, author of Punished by Rewards; The Trouble with Gold Stars, Incentive Plans, A’s, Praise and Other Bribes.2 Why not engage their intrinsic motivation for feelings of autonomy, belonging and competence and work with them on the skills and processes necessary to internalize that sense of responsibility? You will be teaching your kids how to be a substantial contributor in a family. And that will serve them on school projects, collaborative teams at work and in their own roles as parents someday. It will take patience. But rest assured, practicing responsibility at home is practice for a lifetime of caring contributions. Wilson, M.B. (2012).Interactive modeling; A powerful technique for teaching children.Turners Falls, MA: Northeast Foundation for Children. 2. Kohn, A. (1999). Punished by Rewards; The Trouble with Gold Stars, Incentive Plans, A’s, Praise and Other Bribes.NY: Houghton Mifflin. Pingback: Involving kids in household responsibilities—at each age and stage.